Srinagar: Hurriyat (M) has said that elections will not bring any sort of relief to the people of Jammu and Kashmir, but the speedy resolution to the “Kashmir dispute” will. Hurriyat (M) said under circumstances when “repression is an all time high” there is an atmosphere of fear and suffocation, parliamentary elections are being held which is an exercise in futility as holding these elections will in no way bring any relief to people or help in resolution of the dispute or change the reality of repression on ground. “Instead there should be efforts to speed up the resolution of the dispute by pushing all parties to a table for dialogue,” Hurriyat (M) stated. “It is a futile exercise people need to stay away from this as it can in no way help in resolution of the basic issue of Kashmir”. The leadership said that at a time when leadership has been lodged in jails and confined to their own homes, every segment of society has to play its part to contribute towards the Kashmir struggle by remaining steadfast and united. “Instilling Fear and intimidation of people from all segments of society is at full display. Custodial killing is back resistance and religious leaders and youth are being arrested and shifted to outside jails and slapped with arbitrary PSA, frequent CASOs are launched across the length and breadth of Kashmir, there is ban on peaceful protests and even seminars organised to honor our dear are not allowed. Unabated killings continue and the infamous operation all-out is being carried out in full force while people of Kashmir are shouldering the coffins of their loved ones,” Hurriyat (M) stated. The forum stated that people and APHC leadership have repeatedly been urging New Delhi to resolve the Kashmir issue peacefully through dialogue among the stakeholders including India Pakistan and the people of entire J&K. “But instead after the February 14 incident repression has increased a policy of banning political and socio religious organizations and arresting leadership and activists of these parties under draconian PSAs and shifting them to outside prisons, and using NIA and ED to harass and intimidate the resistance leaders and their family members. 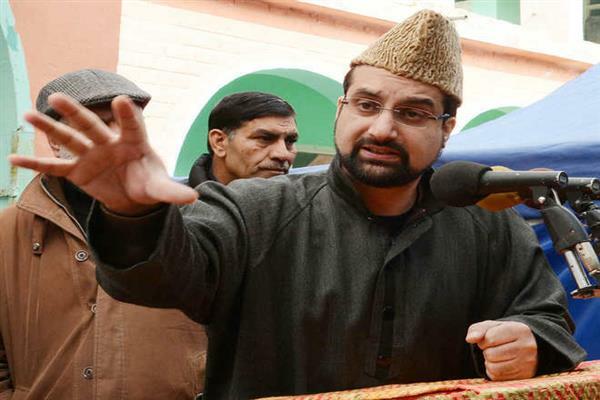 Kashmir has been converted into a military garrison and an atmosphere of fear has been created to intimidate people and choke them,” Hurriyat (M) added.